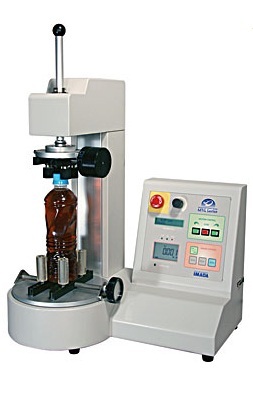 Imada’s motorized cap torque tester accommodates samples containers up to 7″ in diameter and up to 9.4″ in height. Torque markings on the cap vise enable consistent gripping of the cap. Operate in either clockwise or counterclockwise directions. MTG cap torque tester has programmable high/low setpoints to enable go/no-go testing. YELLOW lights up for measurements less than Low setpoint, GREEN for between High and Low setpoints, and RED for over High setpoint and testing automatically stops. Use the real time mode to display torque transients, or the peak mode to capture the peak mode to capture peak torque. Overload capacity 150% of F.S. w/ alarm at 110% F.S.